"Rick Snyder's economy might work for the wealthy, but it's not working for the rest of Michigan." While there are no citations in the ad to back up the claim that Snyder’s policies have only benefited the wealthy, Schauer’s campaign sent Truth Squad several articles that portray an inequitable economic recovery. One citation is to a Bridge article revealing job projections through 2023. Michigan ranked 49th among the 50 states in projected job growth, with much of the growth coming in occupations that pay so little, workers could qualify for food stamps. Another article noted that during Snyder’s term in office, he’s presided over tax cuts for businesses and rule changes that slashed the number of low-income residents who qualified for cash assistance. However, it’s also true that the unemployment rate has dropped since Snyder took office – from 11 percent in January 2011 to 7.5 percent in June 2014. A 7.5 percent unemployment rate is far better than it was, though Michigan still lags most of the nation – ranking 47th in jobless rate. Michigan’s per-capita income grew faster than the national average in 2013, but the state is ranked 35th in income. In his first year in office, Snyder approved a budget that resulted in school funding $930 million lower than the previous year. But about $500 million of that cut was from the loss of federal funding, a loss that was not made up for by the state. Snyder and the Republican-dominated state Legislature increased school funding in subsequent years. Schauer’s claim is a continuation of a fight between Snyder and Democrats over whether school funding is up or down, with both sides able to point to data to back up their view. The claim that Snyder cut funding to education was true for one year, but is debatable over his term. The claim that the Michigan’s economy isn’t working for those who aren’t wealthy is not adequately supported by data. The fact is that some data, including on jobs, show gains that extend beyond the wealthy. It is certainly open to debate whether the wealthy have been the primary beneficiaries of Snyder policies, and if Schauer had added that nuance this claim would be harder to touch. The statement is vague enough, though, that it does not rise to the level of a foul. Wow you had to really strain for criticism here. You say what Schauer says is "debatable" -- that's what a campaign is all about debating the issues. Governor Snyder's claim that a major tax shift from wealthy corporations to seniors, low and middle class workers, homeowners and parents has resulted in job growth is false -- since WW II Michigan's dependence on durable good manufacturing has meant that we lead the way into every recession but lead the way out due to pent up demand. Except this one -- where we are lagging behind the national recovery. Let the debate begin. We should applaud it not "warn" against it..
How can such educated individuals not see what is happening to the middle class in Michigan? I work for an Employment Agency where I am pummeled with applications for skilled trades positions that pay less than half of what they once garnered. Which leads to another issue: displaced skilled trades workers over 40 years old who can't earn a living wage, let alone what they are worth. Our accounts are not accepting them. There's an topic I would love to see addressed. Thank you, Anne. My husband and many others I know are those you describe--displaced, highly skilled workers who can't find jobs. Many of them are going back to college in order to move on to new career fields. These are 40 and 50 year-old people! They will be starting brand new careers at a time they should be thinking about retirement. Instead, they will have student loans to pay off. I agree with you: THIS is a topic Bridge should be researching. The reporters should be interviewing those who work in unemployment agencies and colleges. This raises an interesting question. There was a recent interview on Michigan Radio with a developer who claimed that houses could not be built quickly enough to keep up with demand because of a shortage of skilled trades. Why the disconnect? The disconnect probably is because no mention is made of wannabe employers trying to get skilled tradespeople at unskilled trade wages. Here is my conclusion, based albeit from personal experience and numerous conversations with others my age. Many unemployed individuals ages 45-65 with training and experience in highly skilled occupations have been excluded from job application pools because of two of those factors: their age and their status as unemployed. Employers seem to prefer currently employed applicants ages 25-45 with at least a minimum of training and experience because they work for smaller salaries, probably will not be eligible for traditional pension benefits, currently have fewer expensive health problems, and probably won't receive post-retirement full individual or family health insurance benefits. The Affordable Care Act may alter this equation in ways as yet unclear. However. the familiar adage seems applicable: the best way to get a job is to have a job. Anne as a business owner, not a wealthy one, one issue that I think is connected and never gets talked about is the dramatic loss of profit that companies are seeing. For my business i have seen margins drop more then 10% since 2009. That is $120k that I would love to pass on to my employees and myself. This issue isn't just in my industry but it seems almost all industries. A metal shop that I know has plenty of work, and would love to hire a machinist. But the price he has to charge to get the work doesn't leave enough to bring someone in. I hope this will change soon, just not sure how. 1. Play the numbers game if you want, but the fact is that public schools are receiving less funding. Look at the BIG picture and figure in ALL the factors. 2. The unemployment rates are NOT accurate because they fail to take in account all those who are STILL unemployed but are no longer eligible for unemployment benefits. 3. Michigan's economy has made NO improvements for the middle class--we are poorer than we have ever been. The cost of living keeps going up, and we keep getting pay cuts. In fact, many of us might not even be middle class anymore! 4. I just made up my mind who I am voting for--thank you. 5. I am absolutely furious with this report and have lost confidence in Bridge Magazine reporting--I call a major foul here. I'm sorry Mr. Schauer, but Gov. Snyder's policies are working just fine for me. Oh, by the way, I'm a senior living on a very low income, and the very last thing I want is someone coming in and expanding our already overly bloated government and wanting me to pay for it by increasing some tax or pseudo tax. Rich, I too am glad that Synder's policies are working good for your retirement. Are you one of the retirees that were grandfathered from having their pensions taxed? I have relatives that fall in both categories and the relatives that are now having their pensions taxed (and in this case one was also a State employee retiree) have had to make sacrifices that were not planned for when they retired. Rich-I'm glad you are doing just fine. For this article, however, I don't see anywhere where the ad (or the review) says that Mr. Schauer plans to expand "our ...government.." nor does it say he wants you "...to pay for it by increasing some tax or pseudo tax." Discussion is good, but let's stick to the facts, please. Increasing pension fund contributions to make teacher pension funds viable is a noteworthy goal. But by increasing the annual contributions rate over several years that school districts (and teachers) need to contribute to those pension funds you are increasing their expenses. The net impact has been to decrease the money available to fund K-12 school operations. It is an effective cut in school aid and Bridge could do a better job of explaining that. The Republican's claim is clearly misleading. Higher education..hmmh I what bank is the PENSION money deposited? So how much money are we tasking about? What is the interest .in 1985 my payed 18% a months. Cut the mailing, printing of All goverment advertising and quite hanging them into local restraunt and bars.Without the owners permition! Sick of all this he says, she says politicking. Fact: under the Snyder regime, my salary as a state worker was slashed nearly 20 % if you take into account increased health care costs AND actual loss of wages. Fact: Under the Snyder regime, those at the top of the food chain, with high salaries to begin with have gone even higher even after some in the legislature came real close to being indicted for election fraud. (We need to pay top end Caucus staff over $100,000 dollars, while office staff average $27,000?) Fact: Seniors and teachers HAVE lost out on income through higher taxes on money they already paid tax on before investing for their old age. So if you want to talk facts let's get it straight. Fact: Obama care is the worst thought out solution to providing health coverage for all. There is blame on both sides, but let's get the facts about the lower income people correct. They are the ones suffering while corporations laugh all the way to the bank! The law has always required Social Security trust funds to be invested in Treasury Bonds. Money was not specially "borrowed" for the bailout. I almost always have agreed with the Bridge's "truth squad", but not this time. The evidence is just too plain that the state's poverty rate is increasing, and average incomes are falling, to fault any claim that incumbent's policies are benefiting the few at the top, rather than most Michigan residents. Further, you omit cuts to higher education spending from the Governor's cuts to education, and his cuts have been considerable, thus making a college education less obtainable for Michigan families. Likewise, the employment numbers are greatly skewed because they omit "discouraged" workers who are unemployed, but no longer looking for jobs: this reality explains much of the state's rural poverty (which Bridge has recently explored so well), where lots of jobless people are not counted in the unemployment numbers. It also is a huge factor in urban areas. Clearly, these problems are NOT all Rick Snyder's fault -- but his policies seem to worsen them. Your warning about not enough nuance in this 30 second ad seems both unrealistic and covertly biased in its assumptions. Whine Whine Whine. I'm so sick of dependent democrats bemoaning the fact that they don't get blind increases from their public services unions year after year. YOU ARE BANKRUPTING OUR COUNTRY. Learn to live on a reasonable wage - or get a real job and produce something that people will actually PAY FOR WILLINGLY. Yes, some people need to be retrained and their occupations are not viable forever doing the same thing without learning something new. I've changed jobs 7 times in my career and not all of them have been forward - but it's not Rick Snyder's fault. If anything the hard times were caused by Granholm and constantly expanding wasteful government. Thank you Mr. Snyder for correcting just a bit of the waste our prior governor colluded to create. Do some more and perhaps we'll really make some large strides toward recovery. I happen to be Republican, not Democrat. You are uniformed--do the research. Concerning school funding. Paul Egan, writing in the Detroit Free Press early this year, said, " State funding for K-12 schools has increased by $723 million under Snyder, from $10.7 billion in fiscal year 2011 — the last budget of former Gov. Jennifer Granholm." He goes on to say, " In fact, Snyder’s first budget ultimately increased the state share of education funding by about $134 million, from $10.7 billion in 2011 to $10.8 billion in 2012." Schauer is relying on a " Senate Fiscal Agency report from June 2011 which did not include supplemental appropriations, which changed the numbers significantly." according to Mr. Egan. He also says, " According to the Department of Technology, Management and Budget, by relying in part on a downward determination of what was spent in the last Granholm budget, Snyder can truthfully say he has increased state funding for K-12 education each year since he took office. State school funding grew to $11 billion in 2013 and $11.4 billion in 2014." Like I said, they are playing numbers games. The truth is that education has suffered many cut that have not been recovered. I would like to see the media engage in full reporting of the facts. Seems like folks have a short memory in some respects. I clearly recall year after year of Michigan not having a budget when required and our credit rating dropping as irresponsible spending went on. Once Mr. Snyder became responsible, we met our budget deadline, repaired our credit rating, and now have a substantial reserve. And, it was about time that state employees and teachers caught up with the real world and started to pay for a portion of their retirment and benefits like the rest of us non-government employees. The world and national economies are changing and those "good old days" will never be here again. Well, great article, to show how we can interrupt data and make it sound any way we like. Also the laws that were passed, right to work, tenure law...put me on the unemployed list. 23 year teacher with glowing reviews. Stood up to Principle...out. Don't worry I do not hurt the unemployment rates for the state because I cannot collect so I do not report. Don't worry, the educational world is the only one that does not hire or pay for experience. Yes...great job Lansing. Appreciate all that you have done. I thought nerds liked teachers? My problem is the growing gulf separating the middle class and the rich elite. I like some of what the governor has done. Getting rid of the Single Business Tax was important. But taxing retirement was a direct slap at the middle class, reducing the spending power of middle-class retirees. What he has done to education goes far beyond so-called "cuts." He has forced districts to cut educator pay and eliminated all job security. The disparity between the elite and the middle class is is a national problem. Just take a look at cars. In '70s and '80s there were a few high-dollar cars like Ferraris and Lamborghinis, Aston Martins and Rolls-Royces. Now there are gobs of cars where millionaires are able to throw their money. At a slightly lower level, a decade or so ago, Jaguar was selling rebadged Ford Contours. Now they've moved upmarket, serving a clientele who can easily afford expensive cars. But the middle class? Only the most frugal in the middle class can truly afford to buy the average new car. The buying power of everyday folks is diminished while the mid-level managers are far wealthier than their parents. Even worse, upper-level management, where CEOs sit on each other's boards, make sure all of their cronies continue to get richer and richer contracts, not to mention golden parachutes, just in case they might have to be forced out for being proven incompetent. I'm a conservative, but I can't stand it anymore. 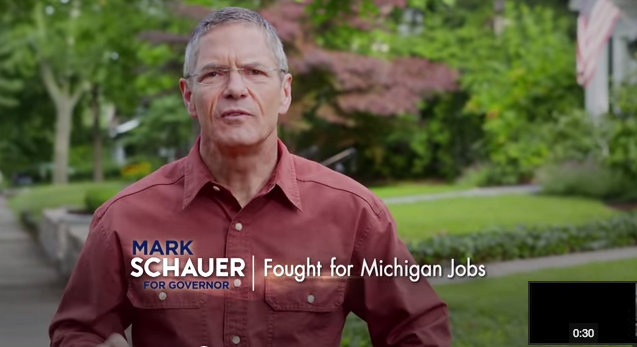 Schauer can't address most of the above, but he can swing the pendulum back toward the regular joe, even if it is just in Michigan. Yesterday this group admitted they were attacking a politician for making a “semantic distinction.” "Like movie reviewing, the 'fact check' (aka 'truth squad') is a highly subjective process. If a politician makes a statement that is flatly false, it does not need to be 'fact checked.' The facts themselves are sufficient. “Fact checks” end up dealing in murkier areas of context and emphasis, making it very easy for the journalist to make up standards as he goes along, applying them more rigorously to the candidate he disfavors...’ -- WSJ's James Taranto IOW, this group is playing spin games and engaging in politics, not legitimate journalism. I don't see how spending more on education will improve the situation in Detroit. Per a 2012 report, Detroit schools are some of the best funded in the nation, with some of the worst results. The problem with education is with the people (parents, community, etc.). It's been said it takes a village to raise a child, and in Detroit these children don't even have parents to rely upon, they are often times more educated than their parents and are left to raise themselves. The same report cites that 47% of adults in Detroit are illiterate (functional or otherwise); these adults could start by going back to school themselves, and taking responsibility for their lives as well as their children's lives. As for the economy only working for the "wealthy", this is a flat-out lie. The transformation of this economic environment enables those who thrive for success. A recent study found that by taking into account those who are unemployed and stopped looking for work the unemployment rate is > 50%, the highest in the nation. However, an Detroit is one of the fastest growing cities when comparing start-ups; most of which started by people who are educated, young, and not from Detroit. This growth in start-ups is a signal that growth is coming, that our economy is diversifying, and some people aren't relying upon employers, they are taking responsibility for their employment status. For me, since Snyder took office, my income doubled, the company I work for thrives, and we continue to increase employment. The issue is that the majority of "candidates" (that I have seen) don't meet the MINIMUM qualifications. If you don't have a job or want to improve your situation, get an education, get REAL experience (whether it's volunteering, interning, or working a job you're over-qualified for). If you are educated, and there aren't any jobs in your field, find out which sectors have jobs and get re-educated (it's very simple). I know that the political campaign season is just pander to the public, but the problems we face as a city and a state can be resolved by taking responsibility for your life, your children's life, and your community.